This month wasn't good in terms of my babies health including my big baby. All of the three got sick last week, they had high fever, headache and nausea. I am just so glad that I was fine and not affected of what they've got. I am also glad that they have an extra day off today due to the President's day. Hopefully, their bodies will fully recuperate and be ready to go back to school tomorrow. They are still coughing but seems to be feeling alright. Kids are suppose to serve to church today but they are coughing so bad so we won't be able to go. Daughter is still in bed, she said her head hurts. I hope someone will be able to do it today. This is the main reason, I keep my active lifestyle because I don't want to be sick. Having a strong immunity system and strong body is important especially during the Winter months. I don't go to the gym but we have a mini gym at home. Treadmill is my regular body when cold season rolls in and I can't do my regular walks outside. I don't walk everyday so when I am not walking, I am using the other things that I have. Love this new Aurorae Yoga Mat Tote that I got from Aurorae. I finally have something where I can put everything that I need downstairs when I am working out. O usually do two trips when I do my yoga downstairs but not that I have this tote, I can put everything theat I need in it. This Yoga Mat Tote Bag can carry all the things that you need. It has plenty of room for standard and premium yoga mats that is up to 28 inches wide. As you can see above, I have my yoga towels, my jumping rope, bottle of water, and my yoga mat in there and there's still a lot of rom. The magnetic snap closures allow for easy access to your yoga accessories, clothing, and personal belongings and it's very easy to snap on. You can secure your valuables in the one external zip pocket or the one internal zip pocket. When I work out, I always have my cellphone with me because I listen to music so the easy access for the cellphone pocket in interior is pretty awesome. 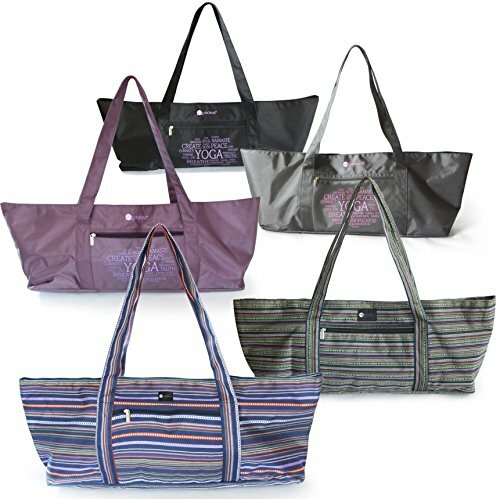 The interior of this tote is fully lined with durable heavy duty polyester for easy clean up, and is designed in our unique Yogi Pose print pattern. This tote is available in colors grey, purple, and stripe as shown in the photo below taken from Aurorae's website. I would have love the stripe but this purple is alright too because it goes p[erfectly with my purple towels. You can buy this via link or by visiting directly to the link I have provided above. This tote is on sale right now so if you need a yoga tote for your yoga mat and other fitness accessories, I highly recoomend this! I am supposed to hit the treadmill in a bit after I am done with this article. I am doing my laundry today so while I am doing that, I will take time to walk on the treadmill again. I cleaned and sanitized the whole house earlier today trying to get rid all of the germs and what not that brought by the sickness. I stripped down all our beds and washing all of it. I also replaced our toothbrushes with new ones, I always do that when one get sick. Lastly, the chicken that I started cooking in the slow cooker is smelling so good (makes me hungry!). Alright, before you get bored with what's going on with my day, I will end this post with the yummy banana milkshake that I made yesterday. My husband decided to hit the treadmill so I rewarded him with this. Hope you all have a great week! Flu bug has been going around like crazy I'm glad that your kids are starting to feel better. I have not done yoga but I love this bag maybe I can use it for what I carry to exercise. My kids have been fighting back to back bugs. It's been awful! I'm trying everything I can to keep myself healthy. Yoga is one of my favourite de-stressors! That's a great mat tote! I love that it has enough room to hold your mat, water, and supplies. I usually just carry my mat, which can be a hassle sometimes, so I need one of these awesome totes. I could use a bag like this for my mat, it looks so handy. I love that you can throw other small accessories in with it. I hope your little guy is feeling better tomorrow. I need to get the Aurorae Yoga mat and Tote. It would be a great gift for a friend of mine. This is a great product and I would say you made a good job in reviewing it. Thanks for this. I hate it when the flu bug hits my home. I hope they are feeling much better now. These look like awesome totes indeed. I am going to have to check out the Aurorae Yoga Mat Totes for sure. They look like they have enough room for anything in them . Thanks for sharing these totes and a banana shake sounds like a really good treat for sure. The stomach flu has been going around everywhere. My family already had it and honestly I feel like I may be getting it again. I haven't been feeling the best today. I hope that your son is feeling better! Winter is great for harboring those yucky germs and being active definitely helps your immune system combat those germs! Hope the little ones feel better and get back up to par! Nothing makes us momma's sad than to see our kiddos sick! Flu and cold season is always rough in our house. We always seem to pass it back and forth. I could use this bag and a mat because I'm fixing to get started back with Yoga. It looks like a roomy bag. I hope everyone feels better soon. Aww sorry the kiddos got sick. I am loving these yoga bag totes. So cute. I have a few yoga mats and one has a little zipper bag, but no room to put anything else in it. This seems like a really great product! It would be awesome to have room for my yoga mat and the rest of my stuff. Hope the kiddos are feeling better. I have been getting into doing yoga. This product looks great. I will have to get one. That looks and sounds like an awesome yoga package! I may try yoga again someday. Love the mat tote, I really need one! I've just resumed my Yoga practice, I've been getting things slowly, such as clothing, special socks, a new mat, now I need a bag! Sounds like the perfect tote for Yoga/Gym Gear! It is great you keep up with your practice even in Winter! That Aurorae Yoga mat tote is adorable! My tote actually looks similar, but it's already old so I may have to get a new one!